Successfully Added HD Digital Video Recorder and Multimedia System to your Shopping Cart. Home HD (high definition) digital video recorder and multimedia enclosure system for 3.5 inch SATA hard disk drives. This enclosure has an advanced motherboard containing integral multi- media software that allows recording and playback of digital media files. In addition, this unit can be used as an external storage drive for computers and NAS (network attached storage) systems. 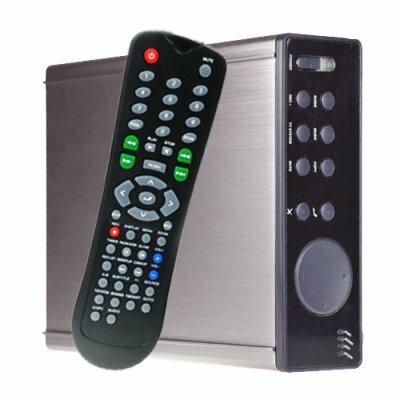 This full featured SATA enclosure with AV recording is the best way to get a digital multimedia player and digital video recording (DVR) system into your home. With this HDD recorder and playback system featuring plug and play functionality, you can install a lightning fast SATA HDD that will provide you with enough capacity to store all the digital multimedia you can imagine: literally hundreds of videos as well as tens of thousands of your favorite music tracks and digital photos. The signature feature for this great multimedia system is its one touch recording (OTR) function, this fantastic multimedia system will record from TV and AV video sources (including DVD player) to provide you with high quality recordings to watch at your leisure. Five quality recording levels provide maximum flexibility for your enjoyment: choose from small file sizes to incredible high bitrate quality! This fully featured system provides component, composite or HDMI output up to 1080i for high resolution viewing. The intuitive on-screen browser interface that ensures effortless navigation to give you convenient access to all of the powerful features. The preview window in the browser provides a user-friendly means to select your favorite media files. A broad range of connectivity options neatly round off this fully-featured home multimedia DVR system: connect to your PC using USB, connect to a mass storage device (U disk, MP3 or USB HDD), make use of ethernet connectivity by connecting to a LAN or use a wireless connection. The choice is yours! A great wholesale price makes this digital video recorder perfect for the resale market, OEM market, or personal/company use. It is in stock right now and is available direct to you wholesale price, exclusively from the original source for wholesale direct from China electronic products, Chinavasion. User-friendly browser interface for effortless navigation and preview files before you play them. Full featured remote control and common function on front panel control buttons. Full multimedia functionality: watch movie, listen to music and enjoy photo playback. Timeshift function, editable recording schedules, set up music playlists. Transfer your media files effortlessly to and from your computer. Note: This product is not sold with a SATA hard drive included. You will need to purchase a hard disk drive separately. HDMI: High-Definition Multimedia Interface transmits the highest quality digital video and audio via a single cable, simplifies cabling and provides high quality home theater experience.